Hey Californians! Thinking About That European Vacation and the Weak Dollar Got You Down? Cost of Airfare Making Hawaii or the East Coast Look Expensive? 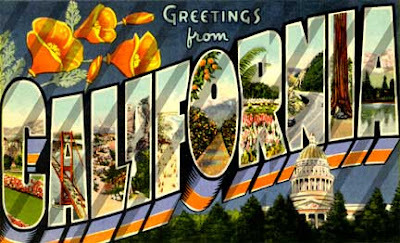 Just load up the ol' iPod with our top ten favorite California songs and you're all set to spend your time (and $$$) here in the Golden State. We purposely avoided the Beach Boys (maybe one too many rounds of "California Girls" did it for us). On a serious note, we hope that our family vacations - whether here in California or elsewhere - are an opportunity to expand our horizons, grow as a family, share our faith in our lives and words, and appreciate and understand the world God has placed us to be part of. We hope our family vacations are an extension of our kid's homeschooling experience. Situated in downtown Los Angeles, on the corner of Broadway and 3rd Street sits a one hundred year old vision of the 21st Century. I've been inside the Bradbury Building several times, including two years ago when I took a group of 17 homeschool kids on a tour of downtown Los Angeles. Most people who drive by it have NO idea what awaits inside. While a private building, the ground floor is open to the public during normal business hours. The architect George Wyman was especially influenced by the 1887 book Looking Backward which described a utopian society in the year 2000. The building opened in 1893, so it's technically 115 years old. Looking Backward (written by Edward Bellamy) described the average commercial building in 2000 as a "vast hall full of light, received not alone from the windows on all sides, but from the dome, the point of which was a hundred feet above." You can see how these descriptions greatly influenced the Bradbury Building. While an incredibly beautiful building in it's own right, what's amazing about the Bradbury is that it represents what people thought buildings in the 21st Century might look like. It's a vison of the future. 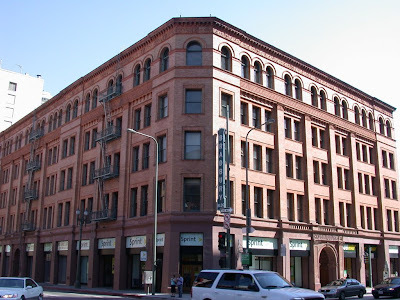 A trip to the Bradbury Building actually challenges me to think about my vision of the future. What am I doing now that might influence the lives of my grandchildren, and great-grandchildren 115 years from now? What kind of legacy am I leaving in the lives men and women I interact with on a daily basis? What - if anything - am I doing now that will influence those in the year 2123 - and beyond? When I was in Elementary School, my mom, dad, sister, and I - along with a friend - hiked from Sunset Blvd and Temescal Canyon all the way to Skull Rock (picture above). As as kid, the round trip hike took us about five hours (as an adult, the same hike takes 90 minutes). I remember my dad saying "next time, we'll hike up to the top of that next peak" (above). I've checked on maps - there's no name for this mountain. I just call it "1729" - which is it's elevation. Unfortunately, we never made that hike. There is no official trail to the top of 1729. But thanks to Google Earth, I was able to discover that, yes, there is an unnamed trail, and even found the trailhead (at the top of Chautauqua Blvd, in Pacific Palisades). Earlier this month, after 35 years, I finally hiked to the top of 1729. The photo above was taken about 6am near the base of the trail, with 1729 in the distance. It's a challenging hike: steep inclines in places, loose rock, and literally some rock climbing towards the top. However, the views at the peak are simply spectacular. The photo above does not do it justice. It was close to a 360 degree view. Continuing on there is a slightly visible trail along the ridge, which is the east ridge of Temescal Canyon. April and May are great times of the year to go with some beautiful wildflowers in bloom. Continuing on for about a mile, this unmarked trail actually hooks up with the "Rogers Road" trail, which I took back down into Will Rogers State Park. Again, until you get to the Rogers Road trail, it's an unmarked trail, and is difficult to follow in places. I do not recommend this as a "first hike" and unless you're familiar with Santa Monica Mountains, would not recommend trying it alone. 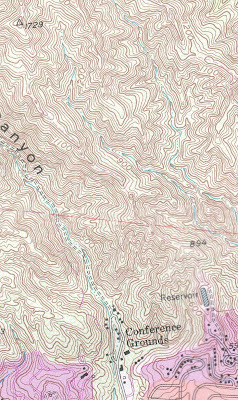 Looking again at my topographic map, I found that, indeed, there is a trail that I had never noticed before. If you click on the map, you can clearly see the trail. Challenging but do able. From the Chautauqua trailhead to the top of 1729 took about an hour. It was worth it. And all within the city limits of Los Angeles. Movies & Merchandise: Marketing PG-13 Movies --- to 3 Year Olds? 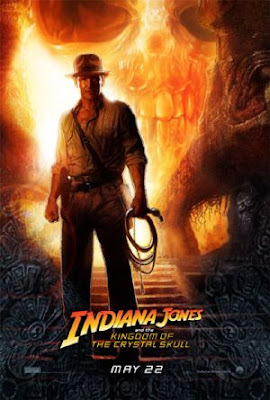 The "Indiana Jones" series has the dubious honor of ushering in the PG-13 rating. After the second installment ("Indiana Jones and the Temple of Doom" 1984) concerned parents demanded the MPAA create a rating to protect their kids from violent and graphic images. Thus was born the PG-13 rating. Pirates of the Caribbean, Spiderman, Batman, Indiana Jones, and the final installment of Star Wars all carried the PG-13. According to the MPAA, the PG-13 rating is a warning: "PARENTS STRONGLY CAUTIONED — Some material may be inappropriate for children under 13." Yet each of these movie franchises, designed for teenagers and adults is aggressively marketed to children, including young children. Fast food promotions, commercials during children's programming, Lego characters, and - of course - toys are all part of the commercial juggernaut. These photos, taken in the toy departments in Wal-Mart and Target, could have been taken anywhere. The packaging reminds parents that the "Cemetery Warrior" from "The Kingdom of the Crystal Skull" is for "Ages 4+"
If the "Cemetery Warrior" is a bit too realistic for your four year old - no problem - how about these "cute" versions of characters "Mutt Williams" and "Irina Spalko"? The packaging says these toys are for "Ages 3+". Does anyone else think it's strange that a movie that "strongly cautions" parents regarding material inappropriate for children under 13 has toys designed for 3 year olds? 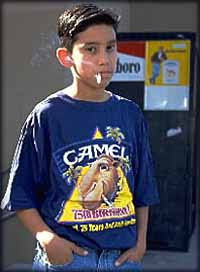 Ten years ago, during President Clinton's administration, the federal government took legal action against the marketing of cigarettes to minors. 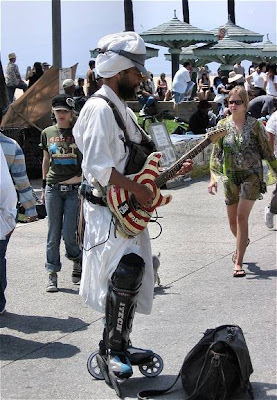 Remember "Joe Camel"? In addition, the entertainment industry got into the act and made it taboo for smoking to be shown in any G or PG movie. Some have even called for a movie showing smoking to automatically receive a R rating. I'm not holding my breath for any sort of similar ban to occur with the marketing tie-ins based on current "action/adventure" films. But how would we feel about cigarettes being once again marketed to children? 1. The Beach. There's never a bad time to go to the beach. We enjoy the stretch of beach (and the free parking - although limited) just north of Sunset Blvd. in Pacific Palisades. Venice and Manhattan Beach are even better when we're willing to drive (and pay) a bit. 2. Santa Monica Mountains. Simply incredible hiking in and around Topanga State Park. Canyon trails filled with native plants, trees, streams, and wildlife. Ridge trails with incredible views of the city and mountains. And - perhaps most amazing - all within the city limits of Los Angeles. I posted some additional photos here. 3. Skirball Center (esp. their Noah's Ark exhibit). Free every Thursday, including free parking. Just up the road from the world renound Getty Center (admission to the Getty is always free, although parking is $15). 4. Los Angeles County Natural History Museum. Free the first Tuesday of every month. 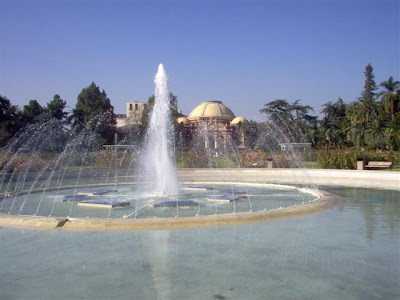 Across the street from USC in Exposition Park. Next to the California Science Center (which is always free). 5. 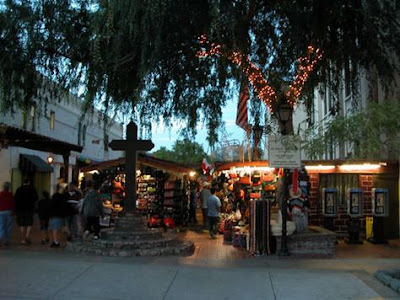 Olvera Street - Los Angeles was founded here in 1781. Fun memories of going here on Elementary School field trips as a kid (now I take my kids here). Philippe's Original French Dip Restaurant is a block away, as is Chinatown. 6. 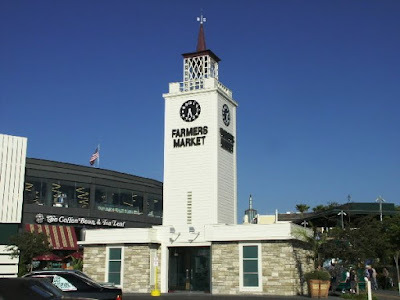 Farmer's Market (3rd & Fairfax). More great memories of my grandfather taking me here as a kid. It hasn't changed much. Next door is "The Grove" outdoor shopping center, which is a little too "mall" (i.e. "maul") for my taste but has a free electric streetcar ride and a fun fountain. 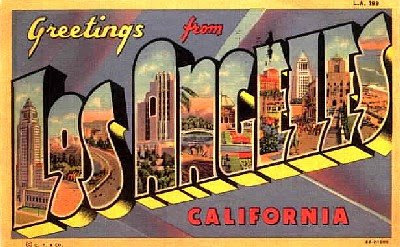 The La Brea Tar Pits and L.A. County Museum of Art are all nearby. 7. 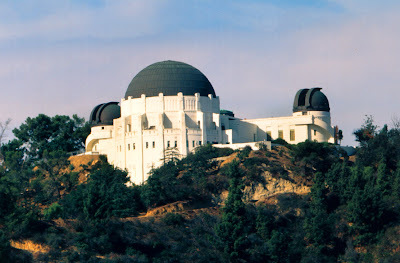 Griffith Observatory. Re-opened a couple of years ago, and everything is free, including the parking. Great displays inside and amazing views of the city of Los Angeles and Hollwood Sign. The Gene Autry Western Heritage Museum is not far (free the second Tuesday of the month). 8. Venice Boardwalk and Bikeway. Funky, wild, wacky, strange, entertaining all describe the Boardwalk. Even if I wouldn't buy most of what's being sold and disagree with every "cause" being promoted, a trip to Venice gets me out of my little shell. As a Christian, I always imagine this is the kind of place where Jesus would have invested His time. The bikeway extends 19 miles from Pacific Palisades to Redondo Beach. 9. 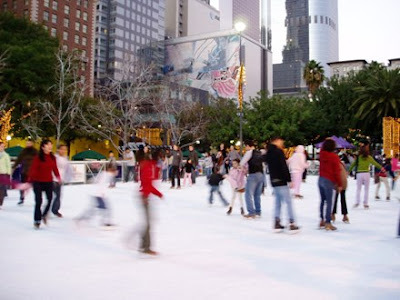 Ice Skating at Pershing Square - Downtown Los Angeles. OK, this is technically NOT free, but it's great to see Pershing Square transformed for Christmas and the holidays. Watching the ice skating is free, but there is fee for skate rental and using the rink for an hour. Lots of other great things to do downtown the rest of the year, but this is our family favorite. 10. Tournament of Roses (aka Rose Parade). Simply amazing. Watching it on TV doesn't do it justice - you have to see in person to appreciate it. And, yes, this is free. Living on the "westside" of Los Angeles reminds us how different our community is from the rest of the country: hearing people in the grocery store wish each other "Happy New Year" in October (Rosh Hashanah = Jewish New Year), having friends greet each other (and us) with what I call "the westside baise" (the European kiss on the of the cheek), the dozen or more Spanish-speaking nannies on any given afternoon at the local playground. 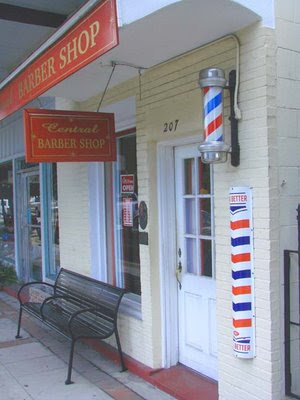 1. the local barber shop charges $30 for a regular men's haircut. Needless to say, I get my hair cut at a barber shop a few miles away on the southside of Santa Monica (in an area affectionately known as "Dogtown") for about 10 bucks. 2. I know parking at some office buildings in Los Angeles can get pricey, but I had no idea how much. I had lunch and a meeting in Century City with someone from my church. Fortunately, his office picked up the cost of parking while I was there. Two hours parking was $32. Ironically, the parking cost more than lunch. Welcome to Los Angeles. 3. I took our kids to a carnival a local private school was having. Must have been a fund raiser, because the carnival rides were $5 - each. I quickly realized two kids on a 3 minute Ferris wheel would set me back $10, and that was just one ride. Then I saw they had "unlimited use" wrist bands. "Great, how much for a wrist band?" $100 - per person. We're not talking "Pirates of the Caribbean" or "Space Mountain" here, just simple carnival rides. I let my kids have $5 or so for some "games of chance" - which, fortunately, even if you lost, you won some kind of prize, sprung for some $2 cotton candy, and went home. Living and ministering in this city, we're constantly trying to figure out what the Apostle Paul meant in I Cor. 7:29-31 when he wrote: "the time is short. From now on those who buy something [should live] as if it were not theirs to keep; those who use the things of this world, as if not engrossed in them. For the world in its present form is passing away." It all comes down to an issue of stewardship: how we invest the time, talent, and treasure (finances) the Lord has entrusted us with. Last summer traveling from Los Angeles to Colorado, we had a chance to take couple extra days and see Zion, Bryce, and Arches National Parks. Wow, really incredible. I first visited these three parks in 1984 with a couple of fraternity brothers. They continue to amaze. It was definitely fun introducing my kids to places that I hadn't seen until I was out of college. Who is the worst American president - ever? I suppose it depends on who you talk with. When people blurt out the current president, it's perhaps showing a lack of historical perspective. There are conservatives who (surprise, surprise) considered Bill Clinton the worst president - ever. And, of course, there are liberals who consider George W. Bush the worst present - ever. Most historians consider James Buchanan, Warren Harding, and Andrew Johnson our three worst presidents. Franklin Pierce, Milard Filmore, and John Tyler generally make the list as well. U.S. Grant left office a very popular two term president (hey, look at the back of a $50 bill). Today, historians often list him as one among the ten worst American presidents. When he left office, Harry Truman had a lower approval rating (22%) than our current President. A half a century later, he's generally admired for his leadership and policies. Fifty years from now historians, as well as our children or grandchildren, will have a historical perspective to debate the strengths and weaknesses of George W. Bush's presidency. Several months ago I came across this website with a visionary plan for a real mass transit system for Los Angeles. www.GetLAMoving.com. I cringe every time I hear someone say "Los Angeles has always been a car culture." Always? 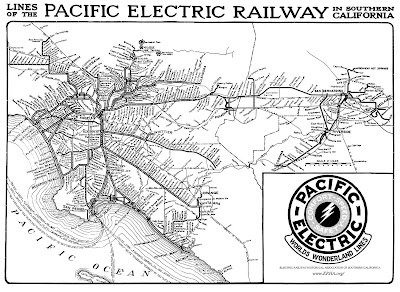 Even through the end of the Second World War, Los Angeles had a massive rail transit system. At it's height in the 1920's, the Red Car system had over 1000 miles of track! Perhaps even more incredible, the population of L.A. County at that time was only one million people - compared to ten million today. 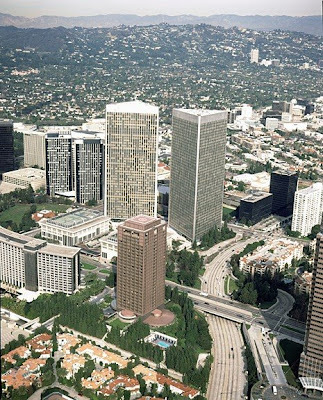 Los Angeles is the second largest city of the richest nation on earth. Our current subway is great - but still extremely limited. Los Angeles doesn't have a "car culture" as much as it has a "convenience culture". People took the Red Cars because they were convienent. Obviously, when the L.A. Freeways were built, traffic was limited, automobiles were more convienent. Today, a bus down Wilshire is stuck in the same traffic as everyone else - it's not more convienent. People will take light rail or a subway when it is quicker than driving, in other words, when it's more convienent. The reason why people on the Westside don't take the subway down Wilshire - is because it ends in Koreantown! We're still waiting. The above map is our light rail/subway system today. The "Red Line" actually ends in North Hollywood, becoming the "Orange Line" bus way though the Valley (transfering from bus to rail = lame). Fortunately, as pictured, the "Gold Line" is being extended from downtown to East L.A. Also, not pictured, the "Expo Line" is being built from downtown through the USC area and on to Culver City. 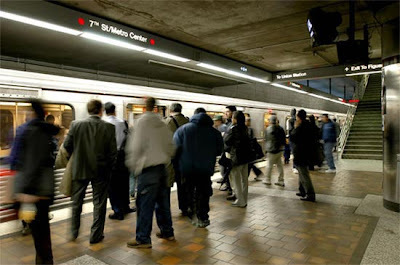 The "Subway to the Sea" (the "Purple Line") needs to be built along Wilshire, through Century City, and into Westwood. The "Green Line" needs to connect to the airport. What were they thinking? The "Blue Line" needs to go all the way to Union Station. A new line needs to go from the "Blue Line" in Long Beach through the South Bay to the airport, to Westwood, and to the north end of the Valley. The individual lines are a good start, but no where near the system our city needs. It's time to get LA moving.